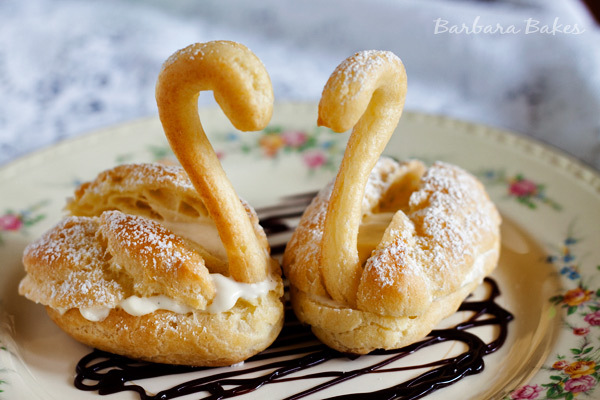 Pretty, golden cream puff swans filled with rich, creamy pastry cream frolicking in a drizzle of hot fudge. 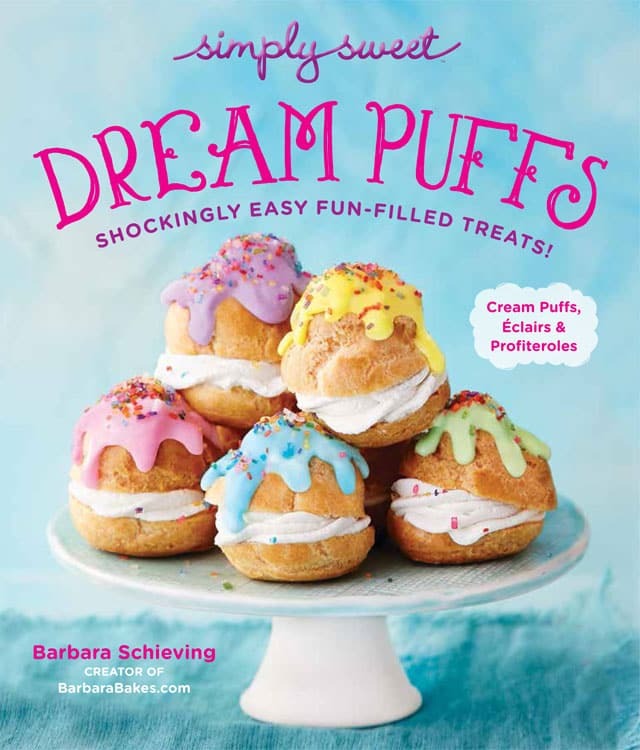 Update: I’ve included an updated cream puff swans recipe in my ebook, Simple Sweet Dream Puffs. You can print templates on your home computer to help you pipe the perfect shapes for your swans. 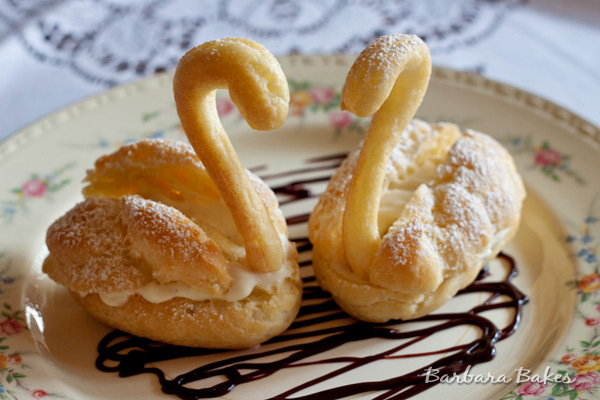 Chocolate eclairs are one of my favorite desserts, so when pâte à choux swans were chosen as this month’s Daring Bakers challenge I was thrilled. I’ve never done pâte à choux in any shape but round or oblong before, so this was a much needed chance to work on my piping skills. 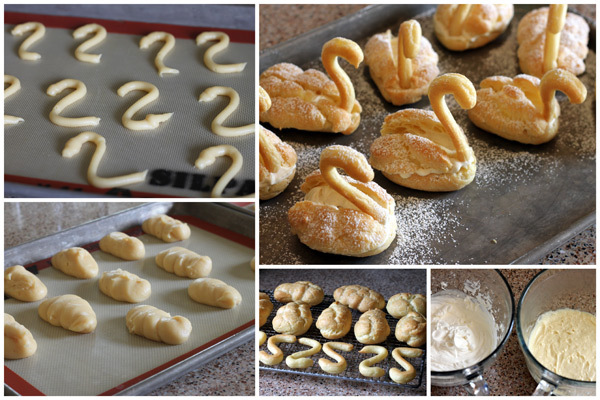 I made my swans bigger than the Daring Bakers hostess, 12 instead of 36. I wasn’t great at piping little beaks, but overall I was really please with my first attempt at swans. If you haven’t made choux pastry before, give it a try. It isn’t difficult and homemade tastes better than from a bakery because the pastry shells lose their crisp exterior the longer they sit. You can fill the shells with your favorite filling, sweet or savory. Instead of the challenge recipes, I used my favorite choux pastry and my favorite pastry cream recipes. 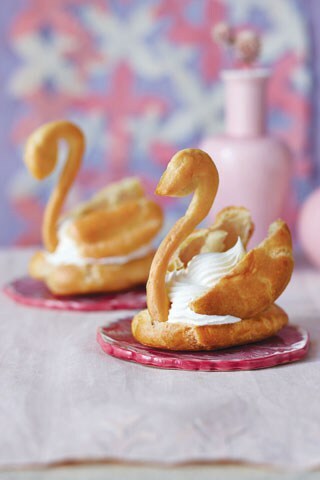 Visit the Daring Kitchen to see all the beautiful pâte à choux swans and other critters the Daring Bakers baked up this month. My swan bodies didn’t rise very much, can you tell me what I did wrong. 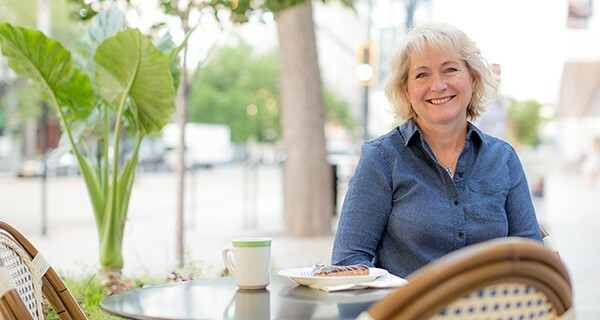 Hi Jean – if you don’t pipe the dough tall enough, there’s not enough dough to create an air pocket. my bodies puffed but then went flat when I took them out of the oven. What could have gone wrong? Hi Anne – sounds like they were undercooked. Try cooking them a little longer, or cooling them in the oven to dry them out. Do you live in a humid area of the country? If they have a pocket, you could still try filling them and the filling will puff them up. 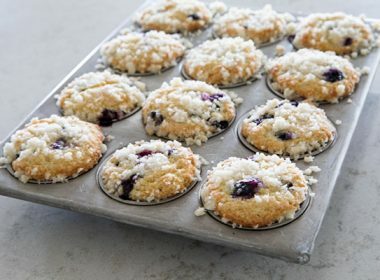 Hi Sadie – ideally I like to serve them within a day of when I bake the shells. However, the shells freeze very well, so you can make them several weeks ahead and freeze them. 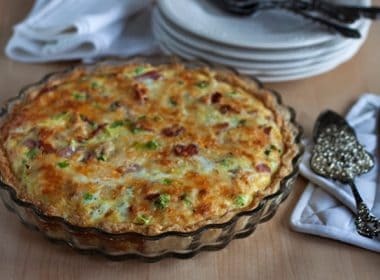 You can freeze the unbaked shaped dough as well, which for a large party I like to do because it takes up less freezer space. Then you bake them from frozen just adding a couple minutes to the cook time. Have fun! Thanks Roberta! Such a great compliment. That really is my goal – to give everyone that I can do that feeling. I’m so glad your swans turned out lovely. 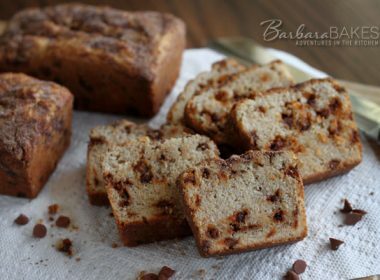 Thank you for a wonderful Mother Day’s recipe! They turned out great! They look great! So fun for Mother’s Day. 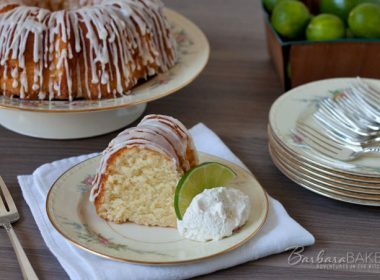 Thank you very much for an amazing recipe. 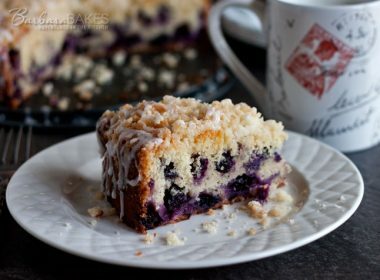 I have done before this kind of pastry, but this recipe is the best. Next time I’ll have my friends over for dinner, for sure it will be on my menu. I tried and felt in love! Hi Maria – Desculpe, eu sou incapaz de traduzir a receita para você. These are gorgeous. You’ve inspired me to try them today! I’ve always wondered how the swan shape was achieved. Thank you for showing it so well. I never thought about the fact that the filling could be sweet or savoury. Suddenly I have an urge for swans filled with creamy cashew chicken.